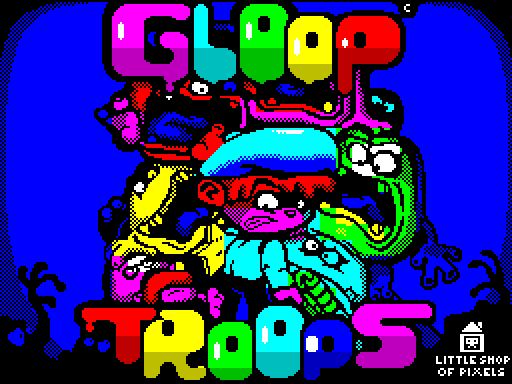 A few years ago, ZX Spectrum developer Little Shop of Pixels introduced themselves to the retro scene with their debut release, Gloop Troops. 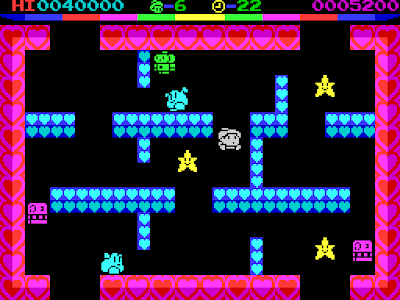 However, due to the memory restrictions of the 48KB machine, not all of their colourful whimsy fit within the confines of a single game, resulting in an additional Christmas-themed rework (Crimbo) and then this bonus level pack released soon after (originally exclusive to the Spectaculator iOS emulator). 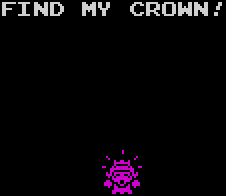 Adding to their original premise with 15 new levels, The Lost Crown is a sort of Gloop Troops 1.5. Continuing where the first game left off (with the princess from the original now safe from peril) your new duty here is to simply act as her personal 'lost and found' - an amusing step down from your previous role of hero that makes me smile. I have a soft spot for single-screen arcade platformers. 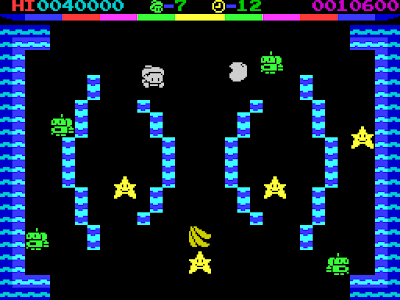 You know the type - Bubble Bobble, Rodland, Don Doko Don, to name a few. The comparison here goes beyond the surface as Gloop Troops embraces the history of the genre. You'll notice all the usual details, from the mundane (when you fall off the screen, you re-appear at the top) to the minute (mid-air motion pauses as you pass through a platform). The graphics are fantastic; each level has a unique tileset, a personality that adds to the game as a whole, and the sprites are equally impressive, with little colour clash and detailed animation. The artist clearly put a lot of love into every pixel and the game visually pushes the limitations of the ZX Spectrum. However, the execution is little more than a proof of concept. Yes, it brings some serious talent together and this game definitely shows off the developers ability; if nothing else, it smacks of potential sure to be realized in the sequel. But, that aside, there just isn't much new on offer in The Lost Crown. Part of the problem is the simple game design - for example, I expect a little more than just a simple 'stun gun' when playing this genre. The controls are tight (perfect, really), but it's not enough. There just isn't enough variety in the obstacles, challenge or the tools available to the player. In short, the 15 levels on offer is enough to stretch the basic concept pretty thin. On the plus side, this is an area where The Lost Crown dodges one of the main failings of its predecessor. The original's 30 levels were far too many and the players initial enthusiasm quickly dims from the flat difficulty curve in the first half. Fortunately, that's not a problem here; these 15 new levels step up and have more of a bite. The invincible rainbow enemies come in sooner and as a whole it's a bit more devious. There are two missing elements seriously wounding the slick polish of this game. For one, the lack of in-game music. There have been many bright speccy tunes and we need another one here - yet sadly (even on 128KB machines) the game's playful aesthetics are supported by nothing but silence. Secondly, Gloop Troops sorely lacks a co-op game mode. I know that's a mean nitpick considering the Spectrum's capabilities, but consider the genre here. It's tough to swallow the disappointment when multiplayer is selected from the menu and it doesn't deliver. This whole paragraph outlines a game that isn't bad, but feels desperately incomplete. In the end, The Lost Crown is more of the first Gloop Troops, and its simplicity adds up to a mildly pleasant distraction. Little Shop of Pixels answered many shortcomings with their 'Crimbo' release, proving that they can make a complete package. It seems trite to point out now what they themselves know was missing back then. Despite your interest or lack there-of in Gloop Troops, anyone with a pulse should be excited for the forthcoming sequel. Simply reading their loading screen tutorial fills you with a sense of their meticulous attention to the craft. They clearly have a lot planned with this brand-new direction. (Originally available exclusively with the iOS Spectacular emulator, The Lost Crown has since been released as a free download for those of the non-mobile persuasion. Check out the Little Shop of Pixels development blog for news about the sequel as well as detailed production logs and post-mortems of their games). I'm gonna give this a go - and maybe revisit Rodland as well. A game I loved but had completely forgotten about! 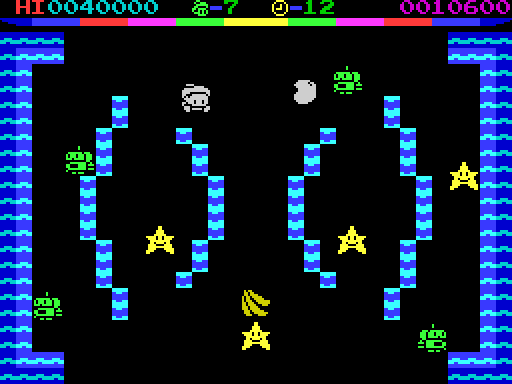 Yeah man - I remember playing Rodland at your house on the speccy when we were kids! Despite the mono graphics, it was a really great 8-bit conversion.